Hello readers!! Today am going to share gel eye mask that helps to reduce dark circles and puffiness. It also helps to treat tired eyes. Prolonged usage of mobile phones and laptop gave me mild dark circle, so i thought to take it seriously and treat my dark circle at beginning stage itself else it will be a tedious task to remove it. So i finally used this gel mask after many trial and errors. This eye mask has goodness of cucumber that helps to reduce puffiness and also reduces dark circles. With regular usage(read daily usage) you can surely notice huge difference. ⦁ Aloe vera gel- 2 spoons. ⦁ Cucumber juice- 1 spoon. ⦁ Potato juice- 1 spoon. 1. Grate potato and cucumber and squeeze it to extract the juice. 2. Now add aloe vera gel and organic honey to the extracted juices and mix well. 3. Violaa our gel eye mask is ready to use. Wash your face and pat it dry. Now soak 2 cotton balls in this mask and let the cotton balls sit all over your eyes and let it sit for 15 to 20 mins. Now relax yourself. Then wash your face with cold water. Do this daily to notice visible difference within 2 weeks. Aloe vera gel: It soothes tired eyes and helps to remove dark circle. It also prevents fine lines with regular usage. It also imparts freshness to your eyes. Cucumber juice: It imparts cooling sensation to eyes. It also tightens skin around eyes thus reducing puffiness. 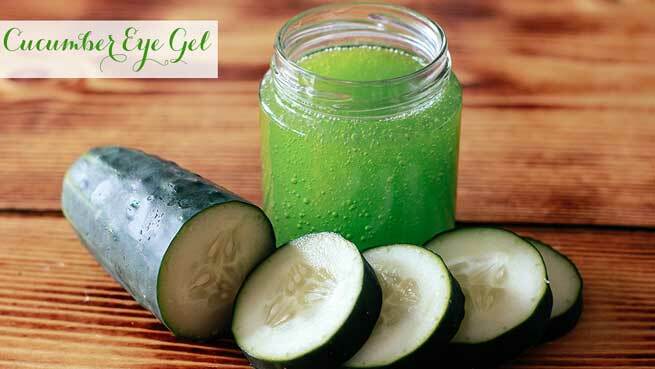 cucumber juice brightens our eye area. It is an excellent ingredient to treat our eyes. cucumber juice hydrates the skin around our eyes. Potato juice: It effectively removes dark circle since it acts as a natural bleaching agent. This speeds up the process of removing dark circles. Share your opinion regarding this eye mask in the comments section. I love to hear your opinions in comments section.